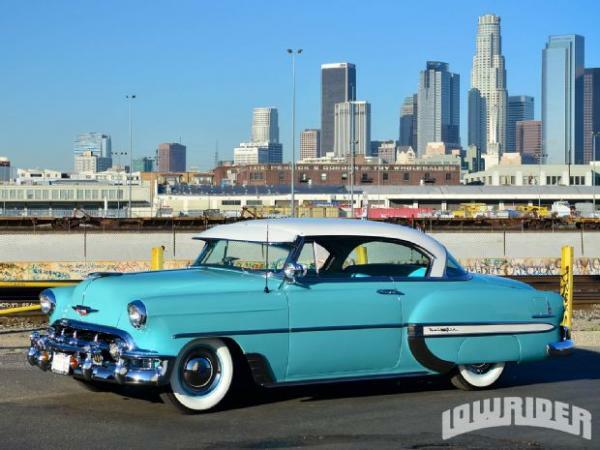 My first set of wheels was a 1953 Chevrolet Bel Air 2 Hardtop, two-tone aqua blue and cream white. It wasn't a "Low Rider" but I tricked it up with fender skirts like this one, a driver-side spotlight, the windshield visor and one of those steering wheel spinners. Just like the one shown. I got it for about $650 in my Junior high school year when my parents moved to another town and I stayed at my Grandmother's house to finish school with my classmates. I joined the army two years later and gave the car to my parents. They sold it and bought new carpeting for their new home in Sandusky OH. I put dual exhausts on it, as it was a V-8 and had those beautiful wide whitewall tires. I learned to drive in a date's 1935 Ford. No auto transmission. I learned how to recognize all the cars of the 40s/50s/60s before all of them started to look alike except maybe for a logo. I'm sorry your parents sold your car -- it would be a collector's item today. I remember those BelAirs. Did you roll your tee shirt sleeves up over your cigarette pack? Oh, my gosh! What a beauty. Thanks for sharing this with us, I can picture you tooling around town with your elbow resting on the window frame. We were talking the other day about how we miss those side window vents - you could direct the air stream into your face, and they were handy when the keys were locked in the car, as long as the latch wasn't closed. Great old cars. I had a few oldies too! The one in the photo is a two-door, was it called a "coupe"? Was yours 2 or 4 doors? fins in pink and I still do. What an awesome car. I love the look of classic cars because they had so much more characters than most of the cars we have today, which generally, all look alike. I learned to drive with my mom's car, which became my car. It was a 1982 Ford Mustang. I miss that car, which I unoriginially dubbed Sally. I learned to drive in one of those butterscotch colored '54 Chevys.